Based on the responses from a 2017 parent communications survey, the Troy City School District has switched to text messages from automated calls for non-emergency communication with guardians. Non-emergency communications includes snow closings/delays, events and news. Text the letter Y to the number 67587 using the phone you would like to receive text messages on. 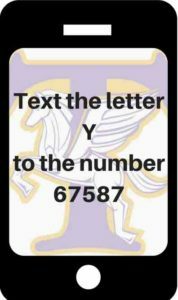 You will receive a confirmation text from School Messenger that you successfully subscribed to texts. If you do not receive a confirmation text, please contact Registration at 518-328-5007 to ensure we have the correct number on file for you and try again in a few days. We recommend parents create an entry in their phone’s contact list for “Troy CSD” and the phone number 67587. This will help make it clear that the text is coming from the district. Parents can unsubscribe anytime by texting Stop to the number 67587. Please note that your cell phone carrier may charge you for texts and data rates may apply. If you have any questions, please contact your cell phone’s carrier. Also, some cell phone carriers do not support short code processing. If your cell phone service is provided by such a carrier, you will not be able to subscribe to SMS messaging even though your phone supports SMS messaging from regular phone numbers.